McAfee and Norton (also called Symantec) are both well-known brands in the antivirus realm, but how do they compare in a head-to-head battle for dominance? Read this in-depth, data-driven guide to make a smart decision. 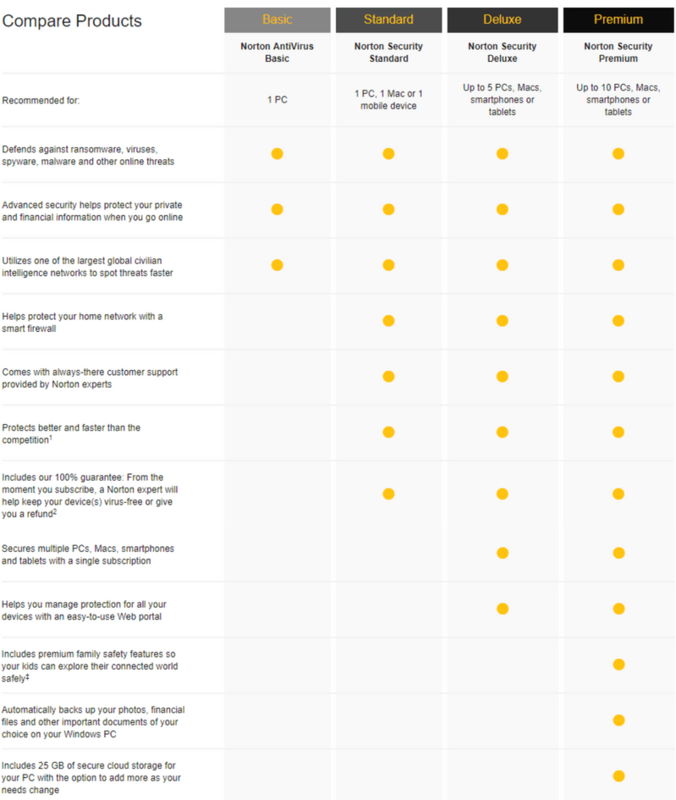 In this comprehensive McAfee versus Norton comparison, you’ll see what features (and utilities) are included in different security products that both companies offer, as well as how both software compare in terms of malware protection, impact on system performance, user interface, cost, and more. Do you know almost half of all computer users worldwide have been (or will be) victims of cybercrime? In the digital age, every link clicked, purchase made, email opened, app downloaded, movie streamed is an opportunity for hackers to break into your devices (especially computers and smartphones) in order to compromise your data and privacy. Do you know the AV-Test security laboratory catches over 350,000 new malware samples every single day? Needless to say, if you don’t invest in a reliable antivirus suite to protect what matters to you, it’s likely that you’ll find yourself in hot water very soon. Hackers are continually surfacing new malware threats, including destructive ransomware, data-stealing Trojans, phishing scams, actual viruses, worms, and all other types of related threats. Luckily, most premium antivirus software automatically update their definitions several times a day to provide protection against all sorts of latest cybersecurity threats. The major downside of free antivirus programs (like Windows Defender) is that it usually offers limited malware protection with no advanced security-related features or extra utilities. These are some of the reasons why experts say Windows Defender won’t keep you safe. So, if you’re looking for comprehensive protection against malware, we strongly urge you to invest in a robust security suite for complete peace of mind. First, let’s see the security suites both McAfee and Norton offer. If you’re in a rush and only want to see the summary of this ultimate comparison, see the infographic below. McAfee is the winner as it offers more security-related features and extra utilities in its products than Norton. Independent lab tests prove that both software provide comprehensive protection against all sorts of malware threats, but McAfee is better than Norton in terms of the impact on system performance. What’s Included in McAfee’s Security Suites? McAfee offers two specialized antivirus suites, McAfee Total Protection and McAfee LiveSafe. In the 2019 range, there’s no difference between the security suites in terms of features, but the LiveSafe is only available with the OEM deals, which means you can’t buy it. McAfee Total Protection is available online for purchase. McAfee Total Protection is the company’s best-selling and most popular antivirus suite. Besides providing excellent protection against all types of malware threats (as we’ll see in the later section), it offers almost all the advanced features/utilities that are usually found in most high-end security suites. Some of the advanced features include a two-way firewall (actively monitors your network traffic and thwarts attacks before they begin), a file shredding tool (lets you delete your sensitive files without leaving traces), the File Lock utility (an encryption tool that allows you create virtual, password-protected drives where you can store your confidential data). The Safe Family module — which offers advanced parental control features — and the advanced True Key password manager are also part of the product. Protection against identity theft and risky websites/links is also incorporated into the suite. To make sure your computer is running smoothly, McAfee includes several performance optimization features, such as Quick Clean and PC Boost. McAfee Total Protection is compatible with the Windows platform, as well as macOS, Android, and iOS. It comes at different price points (as we will see later in this guide) depending on the number of devices covered in your plan. What’s Included in Norton’s Security Suites? The Windows-only Norton AntiVirus Basic is the company’s entry-level offering. Along with providing great protection against different kinds of malware threats (such as viruses, ransomware, spyware), it blocks phishing scams and also protects your sensitive information when you’re online. Not a lot is offered in this suite in terms of advanced security-related features and extra utilities other than a useful password manager, which is available as a browser extension. Next level up is Norton Security Standard. It adds an advanced two-way firewall, premium customer support, and the Virus Protection Guarantee; a Norton expert will help keep your device(s) virus-free or give your money back. You can protect one PC and one Mac or mobile device with a single subscription of this plan. 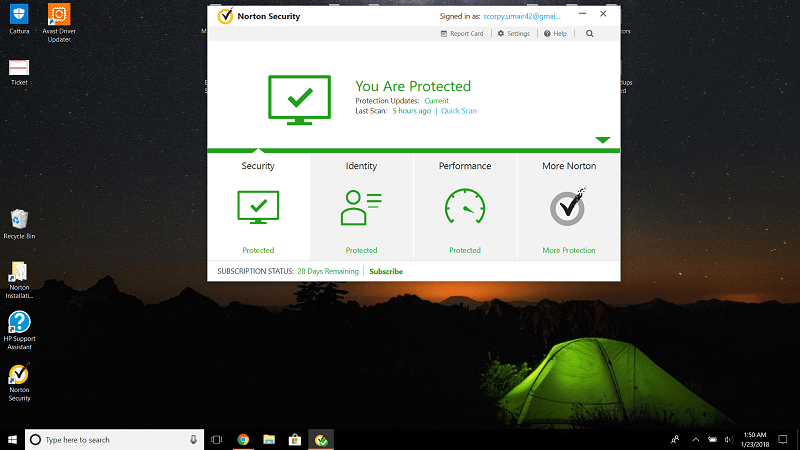 Another level up is Norton Security Deluxe. It includes everything jammed into the “Standard” suite, plus an intuitive web portal (helps manage all your devices at one place) and several PC optimization tools, including a File Cleanup tool and the Disk Optimizer. You can protect up to 5 PCs, Macs, mobile phones or tablets under this suite. Norton Security Premium is the company’s top-drawer antivirus package. Along with everything included in the “Deluxe” suite, it adds parental controls, an automatic backup utility, and a cloud space of 25GB. McAfee Vs. Norton: Which Software Offers Better Malware Protection? Malware protection is the most aspect component of any security software. Generally, malware can be classified into two types: known malware and unknown malware. The former is a type of malware for which digital signatures are already available, while the latter refers to a malware that exploits a previously unknown vulnerability. Most security products rely on signature-based scanning to catch known malware and heuristic monitory to detect unknown malware (also called zero-day malware). To determine whether McAfee or Norton is ahead in terms of malware protection, I’ll look at the independent lab results conducted by AV-Test and AV-Comparatives — two well-known security laboratories that extensively test various top antivirus products. The most recent evaluations conducted by AV-Test were held in January and February 2018 and involved 18 security products. All products were tested against 228 samples of zero-day malware and 4,877 samples of widespread malware (known malware). Norton’s came out of these evaluations with perfect scores; it blocked 100% of both types of malware samples, earning an excellent 6/6 star rating from the experts at AV-Test. On the other hand, McAfee’s results against widespread malware were perfect in both months, at 100%. Against zero-day malware, however, its efficiency dropped to 99.2% in January but climbed to 100% in February. It also received a perfect 6/6 star rating from the institute. The experts at AV-Comparatives do two major tests to assess the protection level of various products: Malware Protection Test and Real-World Protection Test. The latter tests a product against real-world conditions (as experienced by everyday users) with their default settings in place, while the former aims to assess a program’s total ability to prevent malware infections. In AV-Comparatives’ Malware Protection Test, which was most recently held in March 2018, McAfee’s protection rate against malware was 99.95% and returned 10 false positives. It received the “ADVANCED” award, which is the second-best honor, from the experts at AV-Comparatives. Norton, however, didn’t fare as well as McAfee in the test; its protection rate was excellent, at 99.99%, but a high number of false positives meant it had to settle for the “STANDARD” award. In the AV-Comparatives’ most recent Real Word Protection Test, both McAfee and Norton registered impressive results; Norton’s protection rate was found to be 99.5% with 5 false positives, while McAfee protected against 99.1% of malware but it only returned 2 false alarms. Overall, McAfee fared slightly better than Norton in the recent independent lab tests. McAfee Vs. Norton: Which Software Puts Less Impact on System Performance? Most modern antivirus programs are extremely light (in terms of size) and put very minimal impact on system performance. Let’s look at the recent independent lab tests to see which software is better in this category. AV-Test’s performance study looks at the influence of a product on system performance by executing few common computer tasks, such as launching websites, downloading applications, launching applications, copying files. Here’re the results of the same study with Norton installed. As you can see, Norton received a perfect 6/6 star rating in the test, while McAfee managed a slightly lower 5.5/6. The experts at AV-Comparatives do a similar study, called Performance Test. The test measures the influence of a security product on computer performance in a similar way like AV-Test’s study and assigns an impact score to each product depending on their level of impact on system performance. The lower the impact score, the lesser the influence a product has on computer performance. 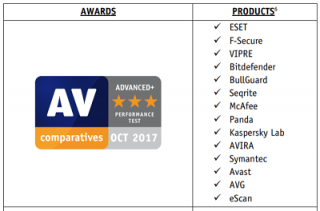 Both McAfee and Norton received the “ADVANCED +” award in the AV-Comparatives’ most recent Performance Test, due to their low impact scores of 7.3 and 8.7, respectively. So, it is clear from independent tests that both McAfee and Norton are equally good in terms of occupying system resources, and neither of them will put an appreciable impact on system performance. McAfee Vs. Norton: Which Software Offers Better User Experience? The horizontal menu at the top breaks down product features into five main categories: Home, PC Security, Identity, Privacy, and Account. The Home window, which is the default view, shows your protection status and also has buttons to run different types of scans. You can also clear your browser of cookies/trackers and set up True Key password manager from this page. The PC Security page lists all the modules that are currently active, such as Real-Time Scanning, Firewall, etc. You can run different kinds of scans from this page, too. Anti-spam filter, File Shredder, and Web Advisor are accessible from the Identity tab. The Privacy tab contains Parental Controls along with few other features, and the Account page shows information about the suite you’re subscribed to. Norton’s bright interface is still the same as it was a few years ago. When everything is okay, you’ll see a reassuring “you’re protected” message next to a green checkmark; it quickly changes to red “X” when there’s an issue that needs your immediate attention. The menu on the homepage has four modules (Security, Identity, Performance, More Norton) arranged in a horizontal manner. The top row has a search bar and also contains links to Settings, Help, and Report Card, while at the bottom you’ll see your subscription status and a link for renewal. From the Security tab, you can run different types of scans, manually update definitions, check error logs, access protection history, and switch on/off other advanced modules. The Identity page covers web protection features and tools, including an Identity Safe password manager. The Performance tab contains features that help improve the performance of your system, and clicking the More Norton module takes you to a centralized online portal where you can manage all your protected devices. Overall, both Norton and McAfee provide a simple, clean user interface. McAfee Vs. Norton: Which Software is Cheaper? Apparently, it seems like Norton’s security suites are slightly cheaper than McAfee’s. But keep in mind that you can protect many devices with a single McAfee subscription. McAfee Vs. Norton: Which Software is More Popular? Both McAfee and Norton are two well-known companies in the antivirus industry, but which of two software is more popular among the community? OPSWAT releases monthly reports on the antivirus market share captured by different companies. As per their recent report, Avast leads the table with a strong market share of 19.27%, followed by ESET (13.15%) and Malwarebytes (12.93%). McAfee currently sits on the fourth spot, with 9.59% market share. Interestingly, Norton didn’t quite make it to the list of top ten antivirus products. On CNET’s download.com, which is the world’s most popular software download portal, McAfee’s products have significantly more overall total downloads than Norton’s. Speaking of social media influence, McAfee has just 0.8 million Facebook fans, as opposed to Norton’s just over 1.3 million. On Twitter, however, McAfee leads the way with over 800K Twitter followers, as opposed to Norton’s 157K. So it’s clear from the above numbers and statistics that McAfee not only captures bigger market share is also more popular among the antivirus community. In the modern, technology-driven world, we store a large part of our life on our computers, so it makes sense to say that we should never take our security and privacy for granted. As far as reviews are concerned, you guys are the best of the best. Perfect explanation of every detail. You should write “How to” books. I am buying thru you link. Keep up the good work! I do not see anywhere on Mc Afee Total Protection the Win operation sys that cover; e.i: Win 10, Win 8, Win 7 pro, Win XP, neither where it is made, could you please comment, thanks. Thanks for your comment, Francisco. Not sure if I understand what you mean. McAfee Total Protection is compatible with most versions (new and old) of Windows OS. Get Bitdefender at 50% Off today!